Maruti Suzuki India's first most SUV - Gypsy is the oldest and still the most loved SUV in India. It is still the only and the best option among many rallyists in India and a favourite option among armed forces. Private sales of Gypsy for regular use is miniscule whereas most of the sales comes from off road drivers and from the armed forces. The other fact that the car is being sold less is that the car is available only in petrol option and looks a little outdated or could say that the competitors are a little more updated now. As per the rumours, the new car would get minor updates in terms of looks. 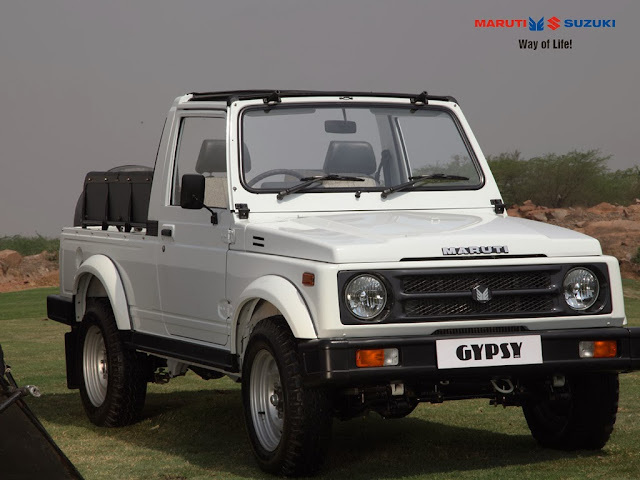 If we go to the history of Gypsy, we would come to know that the Gypsy was first powered by Maruti Suzuki's 1.0L Petrol engine which was later replaced with Esteem's 1.3L G13 Petrol engine and is still available with the same option. This engine is however available only in Gypsy. The Japanese carmaker now plans to replace the current G13 engine with G12B engine which will be a more economical option in terms of it would increase the fuel efficiency and along sides without compromising much on power i.e. the power would almost remain the same. The G12B engine is currently available in Eeco and hence on basis of economies of scale, it would be more feasible for Maruti Suzuki to produce this engine rather than producing G13 engine. The new Gypsy could also be powered by Fiat's 1.3L Multijet engine which is currently powering the rear wheels of Premier Rio - therefore a rear wheel option for Maruti Suzuki's Gypsy could not be ruled out. In that case, it would form a very good competitor to Mahindra's Thar and Force Motors Gurkha. Another important point to notice is that the current length of Gypsy is 4,010 mm and hence a redesigning of bumpers could let it fall in lesser excise duty norms and thus could provide a far better competition.